When a DVD duplicator is mentioned, what flashes through your mind will possibly be a black box-shaped device. But DVD duplicator can be referred to software these days. Compared with hardware, what are strengths of DVD duplicator software? A physical DVD duplicator is easy to get broken or aged. Its average service life will be less than 10 years (reportedly, a DVD duplicator hardware that is used less often can last 5 years or more, but a heavily-used machine may only last from 1 to 3 years). That's way a 4-year or 5-year protection may be extra charged although the machine always comes with a 1-year warranty. Superiorly, DVD duplicator software will never be physically damaged, so it can be used for a life time long in theory. Once a DVD burner is out of date, it can hardly be used normally or be compatible with your current computer or new DVDs. It is time and labor consuming, and even impossible, someday, to get a machine updated. But differently, a standard DVD duplicator software piece will come with regular updates and bug fixes. So you can get it up-to-date with your OS, devices and discs just through a few clicks on your computer with network being connected. The size of DVD copy hardware is about that of a host computer. It takes some room in your house, although not bulky. Imagine there are several devices that need space to pile up. But DVD duplication software just needs to be saved in your PC, taking only a small corner (generally several MBs). The common CD/DVD duplicator brands on the market are, for example, Produplicator, Disc Maker, Primera Bravo，Digifas, PlexCopier, VINPOWER, each product taking hundreds to even thousands US dollars. But DVD duplicator software is much cheaper, some being even free of charge (or free for trial). 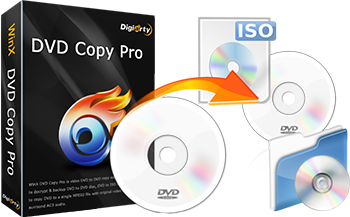 Copy DVD 9 to DVD 9, DVD to ISO file image/DVD (VIDEO_TS) folder without any quality loss; clone DVD to MPEG2 digital file at fast speed with selected video/audio/subtitle tracks. Support flexible title and chapter copy; serve as a DVD burner and ISO mounter. Q: I'm a teacher and I need to duplicate a DVD for 1000 students. Now the total data size of each will be 8 to 10gb. How much time will it take to write? A: If you accept copying the DVD to video, we recommend MPEG-2 format. By converting DVD to MPEG-2, a several GB DVD will be compressed to hundreds of MB and you'll get an original (no compressed) quality digital copy with Dolby audio effect. By using WinX DVD Copy Pro, the whole process for duplicating an entire DVD takes only about several minutes and less than 1% of CPU cost. How to Replicate a DVD Easily with DVD Duplicator Software on Windows 10 or Lower? A computer having at least one DVD-ROM, or connected with external DVD drive. Internal or external hard drive with at least 5GB free space available. A blank writable DVD (double-layer is better). WinX DVD Copy Pro: Download the standalone DVD duplicator software on your PC, which won't take a while and install the exe file. Step 1. Choose "Clone DVD to DVD". Open this DVD duplicator on your PC, and insert your source DVD to the DVD-ROM. 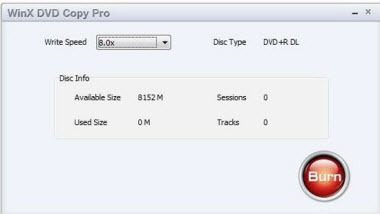 Find "Full DVD Disc Backup" on the main interface of the software, and choose "Clone DVD to DVD". 1. Set the target burner. * If you have two or more DVD drives: Generally, to duplicate a DVD to anther DVD, you need to insert a blank disc. If you have multiple DVD, things will be easier. Make sure you've inserted a rewritable disc into another drive. Then you can set this as the target DVD burner. * If you have only one DVD drive: preset the Temp Folder in the middle of the interface by Browsing in your computer, and choosing a folder that has at least 9GB free space. 2. Check the copy protection removing options. If your source DVD is encrypted (i.e. protected with DVD region code, UOPs, CSS or Disney's fake), make sure the default four options are all ticked. By default, WinX DVD Copy Pro will read 32 sectors per time for fast DVD to DVD clone process, and it will jump 32 sectors when meeting bad sectors, which is recommended to smooth the duplication based on our test. But if some part of your disc is severely damaged, you can flexibly set to jump a larger value of sectors to avoid the damage part. The larger value you choose, the more powerful the DVD duplicator will handle the bad sectors, but the more data you will lose. a) If you only have one DVD RW drive, you will see the dialogue below. At this moment, take out the source DVD and insert your blank DVD into the DVD-ROM. b)	If you have multiple drives, move forward to the next step and you will see the Write Speed and Disc Info. 2. Press Burn button as the final step to start burning a DVD to another DVD. WinX DVD Copy Pro – 1:1 clone DVD to DVD, ISO image file, Video_TS folder, MPEG2 file on Windows (10) without any quality loss at fastest speed. It supports accessing to all region codes and copy protections, and faultlessly supports Disney's Fake, severely scratched DVDs and Sony ARccOS bad sector. DVD chapter copy and extract audio/video only are also available. Try or get WinX DVD Copy Pro now. 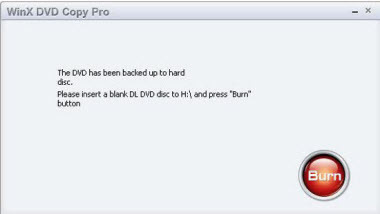 How to Burn ISO to DVD on Windows 10/8/7 With Ease?